Back for a third season and filling up quickly! Put yourself on the path to independent, conscious living by reclaiming the lost skills and healing arts of the traditional farm wife. In the old days, the farm wife knew how to grow, preserve, cook, nourish and heal her family. She could take a small leaf from the garden and turn it into a healing salve, or preserve it for a winter’s meal. Wouldn’t it be great if there was one fun series of classes that could teach you all this and more? It’s the perfect sunny day just begging for a family outing with friends. You grab your picnic basket and load it up with odds and ends from your personal pantry: bits of cheeses, some membrillo, subtly spiced sausage, canned fish, pickled asparagus, crusty bread, dried fruits and kombucha. Your friends pull out their standard grocery store fare and marvel at your lovely spread, every bit of which you made yourself in season from your local foodshed. “How did you find the time or even know how to do all this, and how can you afford it?” they ask, enviously. You smile humbly. “Oh, I have some farm wife friends who made it easy,” you answer, keeping the mystery alive. If this sounds like a scenario you can imagine yourself in then Nelly, are you in luck. Patti and Annette, farm wife extraordinaires, are offering for the first time ever a year-long course designed to put you on the path to farm wife independence and style. The Farm Wife Mystery School is the premier 21st century guide to practical home arts that will help you reclaim that old time wisdom of traditional homemaking. How many times have you wished for the knowledge and courage to plant, grow and use forgotten herbs like horehound, feverfew, valerian, and chamomile? How to clean your home with pantry items instead of caustic agents, estrogen disruptors and carcinogens? How to eat like a king while spending like a peasant? This class will fill in gaps and provide the hands-on knowledge you just can’t find online. Farm wives Patti and Annette will invite you into their kitchens and guide you through the material like only old friends and farm wives can do. It’s January and your wee ones have coughs, ear aches and sore throats Do you know how to turn plants from your medicinal and tea garden (along with a few simple pantry staples) into herbal healing solutions? Patti and Annette will share that old fashioned know-how. It’s March and the days are getting longer. Do you know which seeds to start when, and how to ready your garden? Patti and Annette do. It’s June and the flowers and herbs in your garden are blooming and lush. Do you know what time of day is best to pick them so they will be at peak healing powers? The first fruits of summer are coming in – do you know when to look for things so that you don’t miss out? Annette’s calendar of when things ripen will come in handy. It’s September and summer’s sweet produce is fleeting. How do you know if you have enough of everything to last all year? How can you possibly juggle all those pots, boxes, baskets and canning jars? Can you even find your kitchen counter? Learn to plan, prioritize, and tackle the most important things your family needs, Patti’s secret to slowly reducing fruits into delectable butters without a stove burner, and non-canning methods of preserving produce. Gain the courage and organization you need to plow through September without melting into a puddle of tomato sauce. Patti and Annette know how, and you can too. One Course to Gain the Skills You Need! The Farm Wife Mystery School is a comprehensive course packed chock-full of skills sure to amaze your friends and family and improve the quality of your diet and life. Patti and Annette will help you build that all-important farm wife support network of friends who also crave a life out of the norm. As part of each class, there will be time to share collective experiences (both frustrations and joys) as you integrate these skills into your family life, along with a good dose of practice so it soon feels old-hat. Patti and Annette will pack each monthly lesson chock-full of skill building while helping you explore how to bring the natural expression of the Earth’s seasons into your home in simple, yet beautiful ways. They will show you how to add healthy self-care to the hectic pace of your modern family, and how all this knowledge works together to reduce your financial burden and footprint on the planet. You will leave each class with serious skills and goodies to share with your family or friends. It might be a jar of berry jam to top homemade ice cream, sauerkraut for your home corned beef Reubens, kefir to boost your energy, herbal tea mix for sore throats, soothing bath salts that detox, or some other new favorite thing. The mystery will be how you ever managed to live without this class. Who are Patti and Annette? Instructors Patti and Annette are friends who have spent years unraveling the mysteries of traditional homemaking in a modern world. They both live on small farms of their own with larders full of things they have grown and preserved. Patti Pitcher is the mother of four now grown children (ages 34-20). Since she was a teenager, she’s been actively studying and practicing traditional home arts and herbalism. She lives on a small farm in Snoqualmie where she grows, preserves and cooks as much of her family’s food as she can. On her farm there are orchards, berries, herbs, vegetable gardens, bees, cows, goats, chickens, turkeys, ducks and sometimes lambs. Her house is filled with various pots brewing and projects needing finishing. Always interested in trying something new, she loves learning, experimenting and concocting with plants and food and she loves sharing what she knows. She teaches practical home arts classes with Sound Circle Center in Seattle. In addition, she co-authored Under The Chinaberry Tree: Books and Inspirations for Mindful Parenting, Random House 2003. Annette Cottrell is the mother of two active and curious boys (ages 9 and 12) who pine for sugared cereal and candy. She lives on a small and heavily wooded permaculture farm in progress just outside of Carnation with hugel orchards, silvo-pastures, a large and increasingly perennial vegetable garden, medicinal and tea garden, bees, turkeys, dairy goats, chickens, and rabbits. She breeds Black Copper and Cuckoo Marans (fine French table and dark egg laying chickens,) and Mini Nubian dairy goats that provide high yielding, flavorful cheeses and tasty fluid milk. Annette teaches various farm life classes through the WSU Winter School program, around the Seattle area, and out of her own farm kitchen. She masterminded and co-authored The Urban Farm Handbook: City-Slicker Resources for Growing, Raising, Sourcing, Trading and Preparing What You Eat, Skipstone 2011. I finally got my domain to resolve so the new site, the shorter amount of typing and personal IP: http://www.SustainableEats.com is up! Please switch any RSS feeds or email updates, blog links or other to that one since I’ll be making all future posts there. I have lots to add about putting my tomatoes in the ground, building my hoop house and getting this spring garden party started finally! The irrigation is here and I’m starting to put it in, read why chickens make lousy housepets and see the chicken coop come together. Urban farming at it’s best, right from the comforts of your own desktop. Hope to see you over there! How Can You Save Money Buying Locally? Have you ever heard of a wholesale buying club? It’s kind of like Costco for savvy shoppers who are able to pool orders together with other savvy shoppers and get amazing deals on REAL FOOD. Shhh, dont’ tell everyone about it though. A whole new world has opened up for me this year. I can’t even remember the chain of events that led to this amazing discovery but I know it started with reading Animal, Vegetable, Miracle and then The Omnivore’s Dilemma and then seeking out meat buying clubs which lead to my discovery of the Kenmore Milkshed (how can I be 42 years old and never even knew you could get real milk?) and then all those deals they get gave me the idea to approach other farmers and ask if they had buying clubs. I did it – I didn’t chicken out. We got the chickens today! Could you go no GMO? It’s a great question and one as recently as last summer I would have answered no to. I remember hearing a news report about 4 or 5 years ago that some foods in the grocery store were modified genetically. I felt cheated. I felt deceived. And then I promptly forgot about it. It’s easy to fall back on old eating habits, forget what you’ve read or just assume that the FDA would not allow harmful things in the food chain. That is a naive and dangerous approach. I’ve compiled some tidbits I’ve cut out of recent newletters (mainly the PCC Sound Consumer) or online discussing just how poorly your food chain is regulated. As you read through these, ask yourself if the FDA and USDA are really protecting you. Make your own decision. And when you get done go and join the No GMO Challenge over at Real Food Media. If enough people sit up and pay attention, take the pledge for 30 days, and word gets out to food manufacturers, it will change things. This is your vote. Make it count. NOSB (National Organic Standards Board) voted in Nov 2008 in favor of developing farmed salmon as USDA certified organic. If approved, certified organic fish would be fed 25% non-organic fishmeal from wild or mercury contaminated fish. Think confined feed lot operation only with fish, their pollution, waste and parasites going directly into public waters. Please don’t buy farmed fish. A University of Vienna study found negative effects on reproduction in mice eating GM corn from Monsanto. This same corn is approved for human consumption and currently in foods in your cupboard. 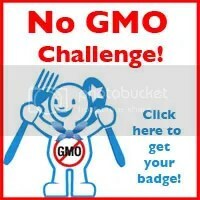 If you are concerned at all by anything you’ve just read here please go sign up for the No GMO Challenge. Your children will thank you by hopefully being able to have children of their own someday. One of my projects for this week, along with re-potting the tomatoes, was to make a scrap composter. We have a great compost program for yard waste in the city but I wanted those nutrients for my yard. I followed the directions I found on a handout I got from a Tilth volunteer at last week’s UW Farmer’s market that don’t seem to be on their website. I wanted to share the list of items that we are growing on our small city lot because it still astounds me that there is room for all this bounty. Once you start looking at your yard as growing space and remove the lawn all kinds of possibilities open up. Maybe this list will inspire you as well. sunflower sentries – these are re-seeding from last year and I’ll re-plant as needed. It’s pretty astounding, isn’t it? All in the same space that was previously un-usable or was rarely used front lawn. We are trying to design the garden so that it fits well with the neighborhood and adds to resell value should we choose to sell the house. With some planning and creativity you can do amazing things with your landscaping. Growing groceries isn’t just for farmers anymore and can fit well into just about any landscape design. A future post for next year when the fruit trees and berry bushes are bearing fruit will be on bees. I wanted to get them this year since I was told the reason some of my zuchini fruits last year rotted and fell off was lack of pollination. For now I’m happy to have gotten the garden beds in and focused on irrigation and chickens. More to come on those topics hopefully next weekend. One last note – all the berry bushes and trees I purchased in March as bareroot stock. It’s a much less expensive way to purchase plants. They are shipped to you during the dormant season for significant savings. I ordered mine online from www.raintreenursery.com and www.onegreenworld.com. Both are located in the Pacific NW and have disease resistant varieties that are acclimated to our conditions. One Green World especially has amazing customer service – phoning before shipping each order to be sure everything is correct and let you know when things are coming. They were great to work with and let me change my order just before shipping. Raintree as well even went so far as to apply a discount code to my order that I had forgotten to use during the checkout process. I recommend them both. Local cheesemaking classes – drink wine and make cheese! Muffins for any occasion – the ultimate in healthy snacking!